Today we released djay for Mac 4.1, a free update for existing users of djay 4. We’ve been hard at work addressing a variety of reported issues and requests to bring you a significant update with new features and lots of improvements. 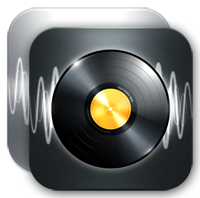 djay 4.1 is a free update for all users of djay 4. Today we are excited to announce our new app: vjay for iPhone. vjay transforms your iPhone or iPod touch into a cutting-edge mashup machine for your music and videos. Mix and scratch your favorite music videos from iTunes, or combine songs from your music library with personal footage into an interactive audio visual experience. You can even use the built-in camera on your device to add your very own clips to the mix with added special effects. vjay lets you create fun video mashups, display directly to a TV, or record your performances live to share instantly on Facebook or YouTube. vjay for iPhone requires iPhone 5, iPhone 4S or the new iPod touch (5th generation). Media Access: Create stunning mashups using all your media on your device, including videos, music, and footage from camera roll. Free Video Content: Includes over 15 exclusive, free bonus video clips by electro-pop superstars Far East Movement, Eclectic Method, Parov Stelar, J-Live, and more. Real-time video transitions, audio visuals effects: vjay comes with stunning audio & video effects, looping tools, visual transitions, and real-time VideoScratch™. Live Movie Recording: With a simple touch of a button, easily save your mixes on your device in real-time. Instant Facebook and YouTube sharing: Instantly share your personal vjay recordings with friends via Facebook and YouTube. Support for external displays: Easily plug into a TV and stream videos wirelessly to Apple TV. Built-in camera integration: Quickly record your own video clips using the built-in camera and add them to your mixes on the fly with added special effects. Integration with iTunes Store: browse, search, preview and purchase music videos on iTunes from within the app. Advanced Audio Tools: Waveforms, Auto-Gain, Automatic Beat and Tempo Detection, BPM Sync, Slicing, Pitch-bending, Cue Point, Looping, Speed Change, Reverse Playback. We’re looking forward to your continued feedback via the vjay Facebook page or @algoriddim on Twitter. We are excited to announce the availability of iDJ Pro, a premium DJ controller made for djay for iPad and created in collaboration with Numark, the world’s leading manufacturer of DJ technology. iDJ Pro expands the touch interface of your iPad with tactile controls that seamlessly integrate with djay to form a truly all-in-one DJ controller. We are excited to announce a free djay update for our iPad and iPhone apps with major new features – now available on the App Store! The free update is available on the App Store right on your iPad, iPhone, or iPod touch, or via iTunes. Today we are exited to announce our revolutionary new iPad app, vjay! 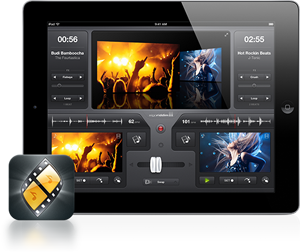 vjay transforms your iPad into a cutting edge mashup machine, directly integrated with your iPad’s media libraries. Mix and scratch your favorite music videos from iTunes, combine songs from your music library, and also use your existing favorite personal footage to create an interactive audio visual experience. You can even use your iPad’s built-in camera to bring your very own clips to the mix! Real-time video transitions and audio visual effects: vjay comes with stunning audio and video effects, looping tools, visual transitions, and real-time VideoScratch™. Live movie recording and sharing: With a simple tap of a button, quickly and easily save your mashups to your iPad in real-time and share with friends. Support for external displays: Plug directly your TV via HDMI using the Apple Digital AV Adapter or stream your videos wirelessly to your Apple TV. Built-in camera integration: Quickly record your own video clips using your Pad’s built-in camera and add them to your mixes – on the fly! Integration with iTunes Store: browse, search, preview, and purchase music videos from iTunes directly within the app.